The winter solstice is believed to be the time for the rebirth of the sun. The solstice ushers out the shortest day and resultantly, the longest night, of the year and welcomes the sun again as it promises longer days with the sun in the sky bringing light and inspiration as seeds that will blossom in the spring. This is also a time for us to go within and to plant our own inner seeds of what we would like to birth, grow, and to envision and intend, as seedlings growing inside of our hearts during the winter months. It is time to envision the seeds we want to plant in our life and allow them the winter time to become new while the sun brings more light into our days and into our hearts and into our dreams. It is a season of the Yule log burning through the darkest night. The winter is the season of transformation from one phase to another; from the longest and darkest night into the promise of the incoming and streaming light from the sun to alight our way, to support our visioning for our spring, and to bring fire and passion to our dreams. In the winter animals hibernate and the days bring us into relationship with darkness like the seed planted in the rich soil of Mother Earth. 1. 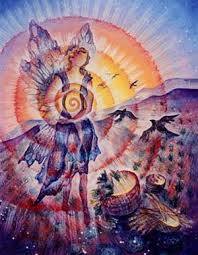 The longest night at the winter solstice is a fruitful time for setting intentions, to be birthed with the newborn Sun. What you conceive now can grow with the Sun, and gain momentum in Spring. 2. You might start a tradition of setting Winter Solstice intentions, and in one year, see how many have come into being. Put them in a special tin or box that has meaning for you. 3. “Hello darkness, my old friend, I’ve come to talk with you again,” Simon and Garfunkel sang in a popular song years ago. Make a special effort today to greet darkness and share some of the feelings that arise in you when you think about darkness. 4. Ponder the darkness as a spur to reverencing the mysteriousness of God. What place have you made for the darkness of the divine as fertile and transformative in your spiritual path? 5. Contribute to the manifestation of more wellness on Planet Earth. Donate food and clothing to poor in your area. Volunteer time at a social service agency. Put up bird feeders and keep them filled throughout the winter to supplement the diets of wild birds. Donate funds and items to non-profit groups. 6. Take time to write, create art, play your music, read/write poetry, meditate, listen to music you love, write letters to friends and love ones, spend time alone enjoying your own heart and soul. 7. Create a vision board for the year to come and fill it with your heart’s desires for yourself and for your family and for the world.